You might hear it as a Kopi Cham, or Yuanyang or simply as Sweetened Coffee and Tea with Milk, but whichever way you call it, it’s with certainty very delicious beverage. 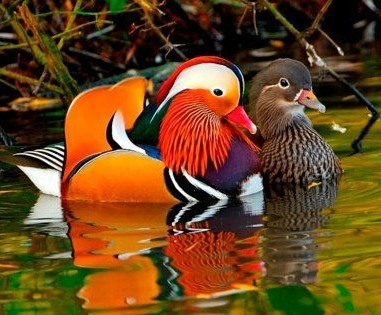 It appears after googling about it, that it took its name from beautiful Mandarin ducks called Yuan-yang. It represents a symbol of conjugal love in Chinese culture, as the birds appear together, but the male and female look noticeably very different. This same association of a “pair” of two different beverage blends is used to call this one as well. Aren’t those ducks adorable? Anyhow, there are many countries that claim that this invention is theirs, and all I know that it’s originated in Hong Kong. You would love this one since it is the best of both worlds. If you are interested, I recommend a blend from our friends at Season With Spice, and if you have never used their spices or visited their shop/blog, you just have to. They have an amazing collection of delicious recipes and their spices are fantastic. Sadly, SEASON WITH THE SPICE will not continue with their business. I really enjoy their spices. I found on the AMAZON, Lipton Quality Mellow Hong Kong Style 3 in 1 Yuan Yang. I have not tried this product, but if you would like to give it a try, do let me know how was it. In a small bowl, place 1/1 to 1 tablespoon of Yuanyang Blend -it depends how strong you like. Pour 2 tablespoons of Hot water. Mix and let the blend dissolve in a couple of minutes. Measure 3/4 cup of Milk and warm it up to an almost boiling point. Add sweetener of your choice, dissolved blend in a drinking cup, and then add milk, leaving at least 2 tablespoons in the other cup. Using hand frother, froth remaining milk until the bubbles are formed, then froth Milk and Yuanyang Blend for a few seconds just to combine. Add the rest of the milk and spoon frothed milk in and sprinkle a bit more of Yuanyang Blend on top for garnish if you desire. Mix and enjoy!